The jintachi is a modern-day design of ancient tachi swords, which were used by samurai prior to the development of the katana. The White Sakura Jintachi with Burgundy Scabbard serves as a great example of the Japanese blade. The functional sword features a carbon steel blade with distinctive Damascus etching. The handle is wrapped with white cotton, and sakura blossom designs decorate the tsuba and end cap of the oriental blade. This sakura tachi sword comes with a burgundy lacquer scabbard and a sword bag. 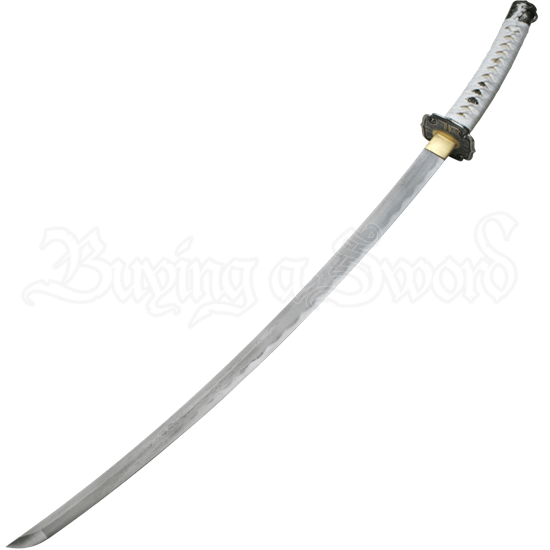 With its stunning look and quality construction, this Japanese sword makes a great option for collectors and swordsmen!